The Stage School provides a unique experience for each student. In both The Company (6-16 years) and The Premier Program (4-6 years) all students receive equal instruction in acting, singing, and dance. In our acting classes, children explore the creation of a character through voice, movement, and imagination. Our acting instructor works with each student through creative role play, improvisation, performance text, and other fun activities. Dance classes allow children to learn about themselves and the world through movement. In our dance classes, children will develop balance, coordination, proper placement of arms and feet, timing, rhythm and how to express their body through movement. Additionally, The Stage School offers after school classes in Creative Drama and Acting and Improvisation. Beginning January 2019, The Stage School will partner with the Oakbrook Terrace Park District to offer our newest class, Make a Musical! 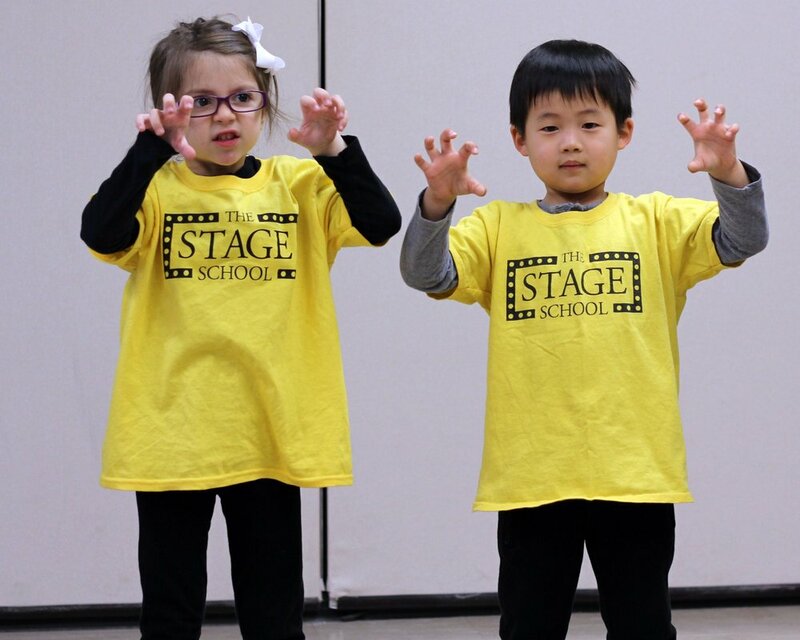 Our Premier Program teaches the fundamentals of acting, singing, and dance to students between 4-6 years of age. In this 90 minute class, students will build core skills, develop poise, enhance their imagination, make new friends, and have fun! Each term ends with a performance in which students showcase their skills. Students in The Company attend for three hours. Students are grouped by age into small classes, so that they receive the maximum amount of individual attention and learning opportunities. All students attend an hour-long class in each of the three Musical Theatre disciplines: drama, voice, and dance. As they develop their skills in these areas, students gain confidence and grow in self-expression, all while having fun and making new friends. Students perform for friends and family at the end of each term. Give you child's imagination a boost! In this class, students will learn the fundamentals of drama through engaging games and imaginative play. Students will develop core skills such as speaking clearly in front of an audience, vocal projection, creating a character, concentration, and teamwork. Students will present a showcase of their work on the last day of term. Students dive into the art of acting through engaging games, scene work, and improvisational exercises. This class will focus on core skills such as proper vocal projection, diction, building a character, learning to use their bodies as expressive tools, and creating a story using improvisation. Fun and hilarity will certainly ensue! Parents are invited to join us on the last day of term for a showcase of the students’ work, and to join in on some of our favorite improv games! Dive into the wonderful world of musical theater! Students will act, sing, dance, and create their own original show based on their favorite Disney heroes and villains. Professional Chicago actors guide students through a unique storytelling process towards a final performance that is not to be missed! Spring Break Camp: Drama Workshop! The Stage School is thrilled to offer this brand new camp for Spring 2019! Join us for a fun and unique experience in drama training and activities! Students work with a professional Chicago actor who will guide them through a variety of fun and engaging acting exercises. Topics will include improvisation, audition technique, acting for the camera, puppetry, pantomime, plus much more! Each day will have different activities and areas of focus. Students can enroll anywhere from one day to all five days!